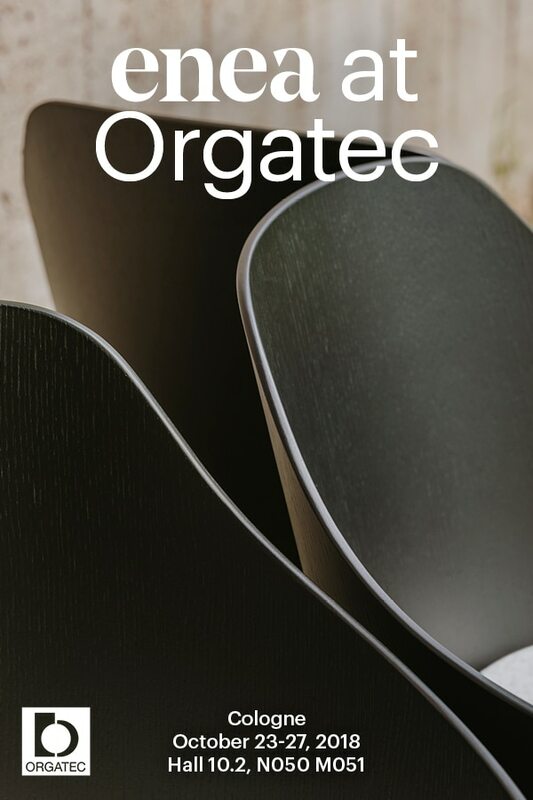 We have everything ready to present our news, as well as the projects we are working on, in the next edition of Orgatec, in Cologne, which will take place from 23 to 27 October. Among the novelties, designed by Estudi Manel Molina, you will be able to discover our Caddy coat stand made of polypropylene, our Ema 4L chair with arms, our Kaiak chair, new accessories for the LTS System table, a lower version of our Puck pouf and our first outdoor chair, Street, in the Stand N050 M051, located in the Hall 10.2. Furthermore, you will discover a little update on what we are working on at the moment; a behind the scenes glimpse into the future, like our Kaiak Lounge, the Caddy table, the new wooden arms for the Lottus collection; the Pile table, specially designed for the contract sector; our exterior Street chair with arms, the Street stool and new Puck puff versions. At Enea, we are always researching and developing new pieces, as our collection grows and evolves while we make the finishing touches to these new additions, we couldn’t wait to show you the exciting innovations that will be coming soon, and that is why we want to take the opportunity to show them to you in Orgatec. In addition, as we have been doing in previous editions, in Enea we organize the special event Cheese&Wine, which will be held every day at 3 pm at our stand. A relaxed time to see up close all our novelties.